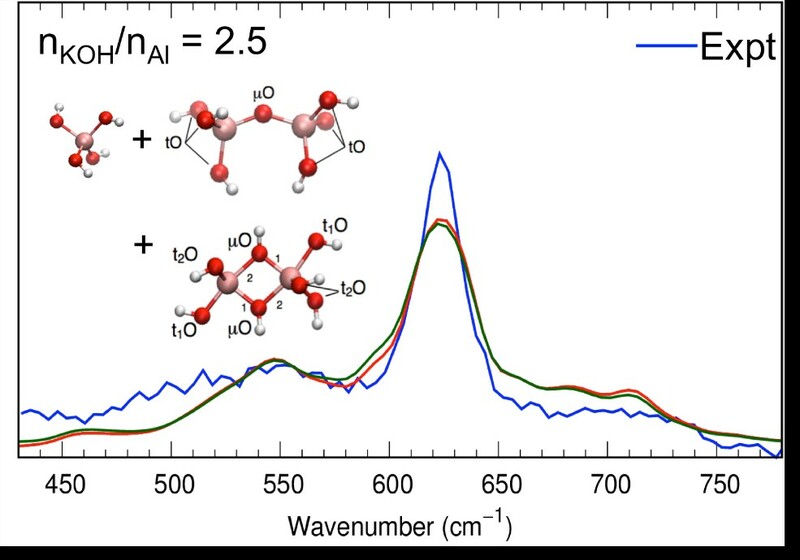 Raman spectra of solutions composed of an aluminate monomer and two dimeric species. Vibrational bands predicted by ab-initio molecular dynamics (AIMD) shown in red and green. Overlapping IR and Raman bands cause different linear combinations of species to have the same overall spectra, preventing identification. Enlarge Image. Dissolved aluminum formed during industrial processing has perplexed chemists by occurring in much greater concentrations than predicted. Efforts to explain the phenomenon have been hampered by an inability to accurately identify the concentrations of each aluminum species present. New research from scientists at the Interfacial Dynamics in Radioactive Environments and Materials (IDREAM) Energy Frontier Research Center sorts out which compounds are present and their concentrations, providing an important new tool with broad applicability. The work, led by Pacific Northwest National Laboratory scientists in collaboration with scientists at Washington State University and Washington River Protection Solutions, was featured in The Journal of Physical Chemistry B in a paper titled, "Ab Initio Molecular Dynamics Reveal Spectroscopic Siblings and Ion Pairing as New Challenges for Elucidating Prenucleation Aluminum Speciation." Why it matters: This finding provides support for improved design of aluminum production and separations processes for energy generation and transmission to high level radioactive waste treatment. Summary: Industrial processing of aluminum for energy production and/or high level radioactive waste clean-up requires dissolving aluminum complexes such as gibbsite (α-Al(OH)3) and boehmite (AlOOH), typically under highly alkaline conditions. Excessively high concentrations of dissolved aluminum could be explained by considering dimeric aluminum species, but spectroscopic evidence to support these species has not been conclusive. Multiple dimeric species are possible, including Al2O(OH)62- and Al2(OH)82-, which have overlapping vibrational bands that prevented unique identification, until now. In this work, we used a combination of Raman and infrared (IR) spectroscopies and computational methods (ab-initio molecular dynamics, AIMD) to resolve vibrational band assignments. Solution phase monomeric Al(OH)4- and dimeric Al as either Al2O(OH)62- or Al2(OH)82- were resolved. In addition, band widths, anharmonic shifts, and average solvent effects were determined, enabling specific band assignments and providing vibrational fingerprints for each species. Furthermore, solvent effects that are important in such concentrated solutions of electrolytes were determined. These results provide a basis for improving equilibrium models for boehmite and gibbsite solubilities, which increases confidence in design of industrial aluminum processing schemes. What's next? The unique identification of aluminum species using vibrational methods will now be applied to concentrated electrolyte solutions containing aluminate to resolve discrepancies in aluminum solubilities under alkaline conditions. This work is related to the Basic Research Needs for Environmental Management, specifically the Priority Research Direction entitled "Elucidating and Exploiting Complex Speciation and Reactivity Far From Equilibrium". Sponsors: This work was supported by IDREAM (Interfacial Dynamics in Radioactive Environments and Materials), an Energy Frontier Research Center managed for the U.S. Department of Energy (DOE), Office of Science, Basic Energy Sciences (BES). User Facilities: A portion of the research was performed at the Environmental and Molecular Sciences Laboratory (EMSL), a national scientific user facility sponsored by the DOE Office of Biological and Environmental Research located at Pacific Northwest National Laboratory. Research Team: Mateusz Dembowski, Sue B. Clark, Kevin M. Rosso, Gregory K. Schenter, Carolyn I. Pearce (Pacific Northwest National Laboratory), Maxime Pouvreau, Aurora E. Clark (Washington State University), and Jacob G. Reynolds (Washington River Protection Solutions).